Did you catch that? We will be as the wind. We see the effects of the wind through the trees, but we cannot see the wind,, but its effects on the material world. Spiritual bodies will come and go much as the wind, but appear at will to whomever we decide to let see us. It’s the ultimate description (to illustrate something we can comprehend) of our bodies when Captain Kirk on Star Trek says “beam me up, Scotty.” Our bodies will move at lightning speed without aid of some transporter as on some popular outer space program. We will be filled with the Spirit of God. Jesus is this man, who has gone to heaven and is sitting beside God the Father in Heaven and delivered unto us the servants, His goods. What goods? Let’s read on in the same chapter of Matthew 25. In ancient times, a talent was a measure of gold. It was the most precious of all possessions. I ask you, what is the most precious possession our God has given us, besides His only Begotten Son? I tell you plainly, it’s HIS WORD! It is His instructions for living, for His reaching us and teaching us by His Holy Spirit unto repentance and using that same Word to reach others. 18 “But he that had received one went and digged in the earth, and hid his lord's money. 29 “For unto every one that hath shall be given, and he shall have abundance: but from him that hath not shall be taken away even that which he hath. 1. A priest has access to God, as did the priest in Ancient Israel that other people did not have. Now because he had access to God, we therefore understand that the priest served God personally. Think of this in relation of the life that’s coming, but do not detach it from today. Remember, you are a royal priesthood. All people on earth, either Jewish or Gentile, will be subject to the righteous rule of Jesus Christ as He sits on the Throne of David and all the earth will know Him…..in their mind they will know, but in their heart they still possess a sin nature. How many people will enter a 1000 year reign of righteous rule by our Lord Jesus Christ? The number is unknown, but remember that out of 8 souls that were saved out of the flood during the life of Noah, the whole earth has been populated. How many souls can be borne in a thousand years, coupled with the fact that men will live extremely long lives, as it was in the days of Methusaleh who lived almost a thousand years, pre-flood. So the population will grow exponentially. Millions/billions can be born in that amount of time. That’s where we come into our responsibility. As priests and kings of the King of Kings, our job, our commission is to be rulers, yes….priests to the people to point them to the Savior, most definitely. We are being instructed in righteousness right now, on this earth, in this time we have left. You ask, “how do I become one of these kings and priest?”It’s so simple, that a child can do it. 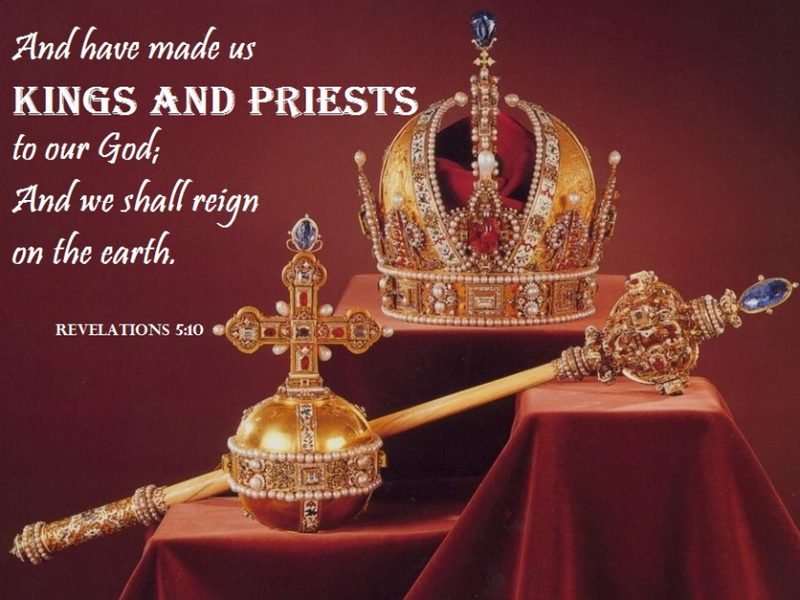 Want to know the secret to obtaining such a high honor of a king and a priest in God’s Kingdom? “For God so loved the world, that He gave His only Begotten Son, that whosoever believeth in Him, shall not perish, but have everlasting life. It is that simple…believe on the Lord Jesus Christ, as the Son of God, crucified for your sins and mine, raised from the dead, and lives forevermore, and waiting to return for His Bride, and so we shall ever be with the Lord. Accept Him by faith into your heart and soul, with a simple prayer of repentance for being a sinner and needing a Savior for all have sinned and come short of the glory of God. Then turn from your worldly, sinful ways and follow the Savior of the world. That Savior, is Jesus my Lord. Oh, won’t you join us, those who have already accepted Jesus as personal Savior? It will be most glorious, and unimaginable to contemplate what God has in store for us who believe on Him by faith. This is Pastor Mike Taylor praying for your salvation through Jesus Christ, our Lord. If there be any need for prayer, counseling, or just a listening ear, email me at realteam1999@sbcglobal.net, or visit me online at my blog, www.pastormiketaylor.blogspot.com, for more biblical lessons for Christian living and the soon return of our Lord Jesus.